Belfast boxer James Tennyson has confirmed his move up to lightweight after vacating his European and Commonwealth super-featherweight belts. 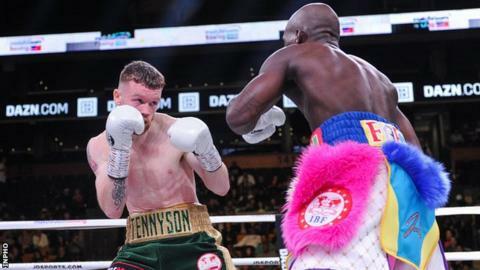 Tennyson lost an IBF world super-featherweight challenge in a fifth-round stoppage by champion Tevin Farmer in October. The 25-year-old made a winning return to the ring as a lightweight in his native city earlier this month. "The extra five pounds will give me edge as my career continues," he said. Tennyson stopped previously unbeaten Portsmouth fighter Garry Neale at the Ulster Hall on 9 February and the Belfast man was pleased with his performance. "I feel that prior to the Neale fight at lot of my previous camps over the last three fights were focused on making weight," added the former champion. Tennyson's management has informed the world governing bodies of the fighter's decision to move up in weight. The Belfast man began his career as a featherweight and has won 23 of his 26 contests. He won the European and Commonwealth super-featherweight titles last May with a fifth-round stoppage of England's Martin J Ward. Tennyson will be back in action against an unnamed opponent at the National Stadium in Dublin on 30 March.